There’s a new breed of marketer that came into existence over the last few years. It was a collision of marketers and tech people which resulted in marketing tech people!! I’ve a tech background and drifted into marketing and it took me a few years before I was comfortable being called a marketer…. But as a technical marketer you think a little bit differently than a traditional marketer. I’m not saying it’s better or worse, I’m just saying it’s different!!! 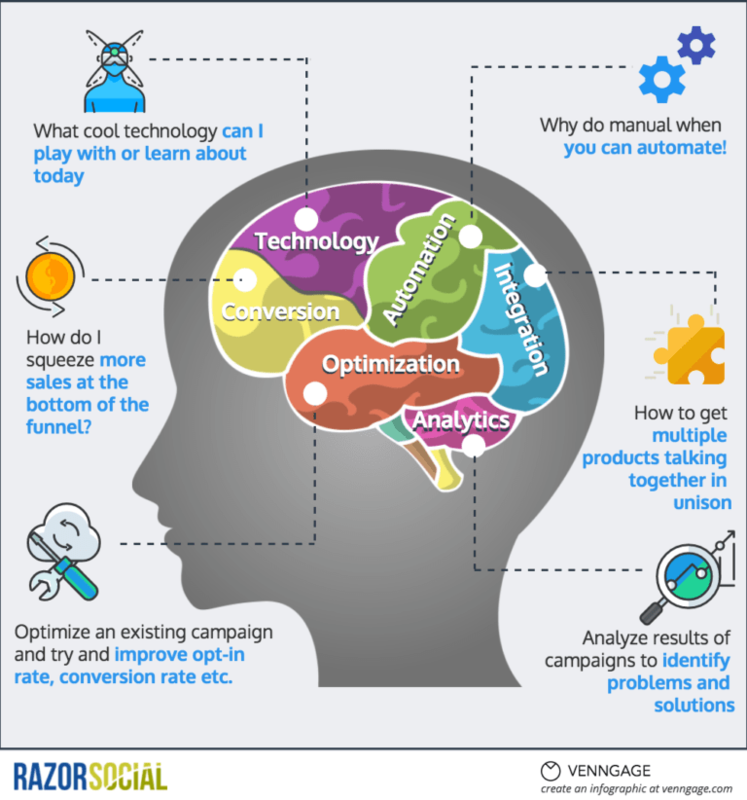 The following infographic brought to you by RazorSocial and Venngage Infographic creator shows what marketing tech people are more likely to be thinking than traditional marketing…. Analytics – Marketing tech people are obsessed with analytics. They want to know how their digital marketing activities are performing at all times. Nothing gets them more excited about their work than unlocking insights from data. You’ll often find them nose-deep in spreadsheets crunching numbers and looking for opportunities to optimize the business. They’re interested in analytics that helps them measure the performance across their website and their tool of choice is typically Google Analytics. They use it to get a complete insight into everything that happens on their website – from visitor behavior and traffic sources to conversions and referrals. Some of the marketing tech pros working within a lager system will also have a GA alternative in place, a tool such as Kissmetrics. A marketing technology person is also concerned with measuring the effectiveness of their email marketing. They want to calculate performance for every email campaign they send looking at all the key stats, such as open and click-through rates, bounces and unsubscribes, and overall ROI. Depending on the needs of their business, they’ll use anything from basic email marketing tools such as MailChimp, to more sophisticated solutions such as InfusionSoft,Ontraport,Convertkit or GetResponse. Another area they’re focused on is analyzing the social media performance. While some marketers rely on native automation and analytics capabilities of platforms such as Facebook, Twitter and LinkedIn, tech-savvy marketers are typically adding third party tools to the mix. They use social media management tools like AgoraPulse or Rivaliq to manage, report and analyze all their social media channels from one place. Optimization – A marketing tech person knows that Conversion Rate Optimization (CRO) can help them maximize the ROI of their website and consequently drive business growth. This is something that definitely keeps them up at night! I recently presented a large group of businesses in the tourism industry where the majority of sales were online. Less than 5% knew their conversion rate. A marketing tech person will know the CRO rate for sales on the website. They will see a landing page with conversion rate of 1.2% and wonder why it’s not 2%. They’ll use a heat map tool, such as HotJar or CrazyEgg, to test a landing page to find out where users have clicked on a page, what attracted their attention the most, whether they saw their email opt-in box, etc. Keyword research tools for finding the best long tail keywords to target (Google Keyword Planneror KWFinder). SEO competitor analysis and tracking tools like SEMRush for examining overall SEO performance. Link analysis tools, such as Ahrefs for performing competitive backlinks analysis and analyzing their website’s link profile. Automation – Marketing tech people want to automate everything. Marketing automation helps them streamline their marketing by replacing repetitive activities with automated solutions. A dream of every tech-savvy marketer! They use Marketing automation tools to tie all marketing efforts together, e.g. target prospects with greater precision, improve engagement, drive better quality leads, and consequently increase revenue. There are many marketing automation tools on the market, ranging from basic tools designed for small businesses (HubSpot, InfusionSoft) to extremely complex enterprise-ready solutions (Ontraport, Marketo). Marketing tech people are concerned with sourcing the right tool for their business and making sure its delivering value on an ongoing basis. Integration – Marketing tech people believe in the power of integration. With so many different apps and services being used daily, it is really important for them to connect as many of them as possible in a meaningful way. So, for each new tool they add to their stack they want to make sure it will “play well” with the others. That’s why they love tools like Zapier or IFTTT that help them synchronize and integrate different apps. For them, it’s all about the ability to set up multi-app workflows that will run on their own, taking their productivity and the overall marketing effectiveness to the next level. Technology – Part marketers, part technologist, it’s only natural that they’d be interested in new technologies, especially those that will have a big impact on the field of marketing. They love reading about the latest tech, such as the Internet of Things (IoT) and how it will be applied on marketing. They’re interested in Conversational Interfaces (e.g. chatbots) and all the new possibilities for improving customer engagement through AI-powered tools. Tech-savvy marketers will be on top of the new platforms relevant for their business, they’ll consult the marketing technology landscape, read/watch new product reviews, and regularly test a lot of new marketing tools to make sure their stack is the best it could be. At the end of the day we want what other marketers want – more conversion. We’ll use some of the tools listed above to help us achieve more conversion. We’ll also use checkout page tools such as Thrive Cart or Sam Cart. Our ultimate goal is to achieve more sales and like to think we always have one eye on this along the way. 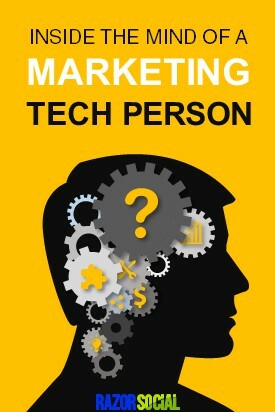 Marketing technology folks are different kind of marketers. They are focused on the marketing areas that, coupled with the right tools, truly move the needle for the business. They’re capable of understanding and implementing the best-of-breed solutions and then connecting the dots between marketing, sales and revenue. But of course they are not perfect. They certainly have their skill gaps.